This statistic depicts the number of homicides registered in Brazil from 2006 to 2016, sorted by ethnicity. 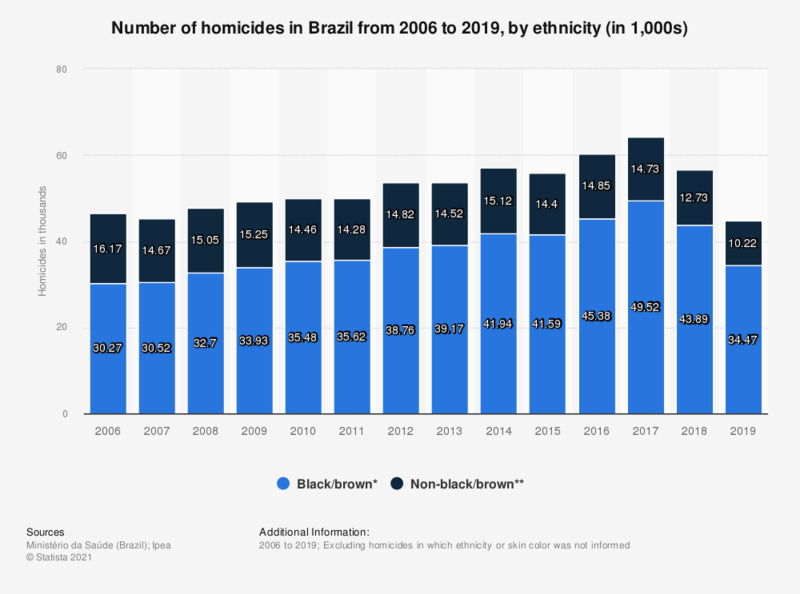 In 2016, approximately 45,380 black or brown-skinned people in Brazil were victims of homicide, whereas the number of non-black/brown homicide victims amounted to about 14,850. The homicide rate among black or brown-skinned Brazilians stood at 40 murder victims per 100,000 inhabitants in 2016. * This category includes people with various shades of brown and black skin. According to the Brazilian Institute of Geography and Statistics (IBGE), brown-skinned people ("pardos") are Brazilians with mixed ethnic ancestry. ** Including people with white and yellow skin, as well as indigenous people.